A pulled groin is an injury that occurs when the muscles in the inner thigh get overstretched or torn. This can happen when they contract too quickly during activities such as running, jumping, or changing direction. Although a pulled groin is a common injury among athletes, it can happen to anybody. This is because groin muscles can tear or stretch when pivoting to avoid a tackle, changing directions quickly to catch a ball, or when stretching beyond the natural limits of the muscles. Any type of sudden movement in the groin area can potentially cause a strain or pull, especially when the muscles are not properly warmed up. At the moment the injury occurs, you might also feel a snapping sensation in the groin area, followed by intense pain. After a few days of rest, when the pain has started to subside, you can help move the process along by performing stretching and strengthening exercises. Start with gentle static stretches, and move on to dynamic stretches when you can do the static stretches without pain. For each static stretch, hold the position for 30 seconds. Repeat this several times a day. Seated short groin stretch: While seated on the floor, bend the knees, and bring the soles of the feet together in front of you. With a straight back, use your elbows to gently push your knees toward the floor until you feel a light stretch in the inner thigh, and hold the position. Seated long groin stretch: From a seated position, extend both legs out to the sides of your body to create a V shape. With a straight back, gently walk your hands forward as you bring your torso toward the floor, and hold the position. Repeat this process while facing each leg. 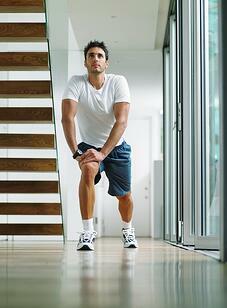 Hip flexor stretch: Start in a forward lunge position, and lower the back knee to the floor. Keeping your shoulders above your hips, gently lean forward to stretch the muscles in the front of the hip, and hold the position. Repeat on the opposite side. Swinging leg stretch: Balancing on one leg, swing the opposite leg forward and back, without forcing it to go too high. The motion should feel relaxed and not strain the muscles in the hip and groin. Swing each leg for 10 repetitions. When you are ready to start stretching exercises for your pulled groin muscle recovery, you can also complement them with movements that will strengthen the muscles in the groin area. Again, start with static exercises, and then move on to dynamic ones. Bent-knee adductor exercise: Lie down with your knees bent and feet flat on the floor. Use a small medicine ball placed between the knees to create resistance, and squeeze for five-second intervals. Repeat 10 times, and increase the duration and number of repetitions as strength improves. Straight-leg adductor exercise: Remain in a reclined position, and extend the legs flat on the floor. Place the medicine ball between the ankles, and repeat the squeezing exercises outlined above. Hip adduction against gravity: Lie on your side on the floor with the top ankle resting on the seat of a chair and the bottom leg under the chair. Slowly lift the bottom leg to touch the bottom of the chair seat, pause briefly, and then lower the leg back to the floor. Perform the exercise 10 times on each leg, and repeat three times a day. Hip adduction with resistance bands: As groin strength improves, you can add more resistance to hip adduction exercises with bands. Secure one end of a resistance band around your ankle and the other end around an object that will not move. Standing on the opposite leg, position yourself so that the resistance of the band will increase as you gently swing your leg toward the centerline of your body without bending the knee. Do 10 repetitions on each side, and increase the number as strength improves. You can administer this treatment with traditional ice packs and compression bandages, or increase the effectiveness of therapeutic cold and compression with a cold therapy system. If the pain is so severe that cold therapy cannot sufficiently dull it, your doctor might recommend temporarily taking an over-the-counter pain medication to help reduce pain and swelling during your pulled groin muscle recovery. After the initial swelling and inflammation has subsided, some people like to apply therapeutic heat. This can help loosen up stiff muscles and increase range of motion. Massage is another popular method for reducing tension in the groin muscles while recovering from a pull or tear. This type of treatment is appropriate after the area is no longer tender to the touch, as otherwise it might be too painful and uncomfortable. For more information about pulled groin muscle treatment and prevention, download the Guide to Accelerating Hip and Groin Recovery. This free resource provides methods for pain relief and activities you can do to shorten your recovery time.